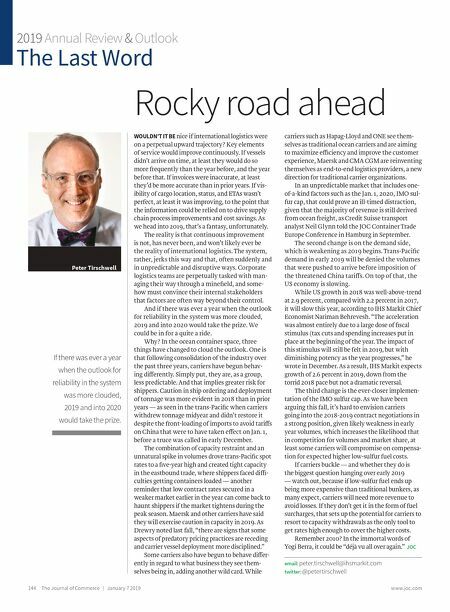 144 The Journal of Commerce | Januar y 7 2019 www.joc.com 2019 Annual Review & Outlook The Last Word Peter Tirschwell Rocky road ahead WOULDN'T IT BE nice if international logistics were on a perpetual upward trajectory? Key elements of service would improve continuously. If vessels didn't arrive on time, at least they would do so more frequently than the year before, and the year before that. If invoices were inaccurate, at least they'd be more accurate than in prior years. If vis- ibility of cargo location, status, and ETAs wasn't perfect, at least it was improving, to the point that the information could be relied on to drive supply chain process improvements and cost savings. As we head into 2019, that's a fantasy, unfortunately. The reality is that continuous improvement is not, has never been, and won't likely ever be the reality of international logistics. The system, rather, jerks this way and that, often suddenly and in unpredictable and disruptive ways. Corporate logistics teams are perpetually tasked with man - aging their way through a minefield, and some- how must convince their internal stakeholders that factors are often way beyond their control. And if there was ever a year when the outlook for reliability in the system was more clouded, 2019 and into 2020 would take the prize. We could be in for a quite a ride. Why? In the ocean container space, three things have changed to cloud the outlook. One is that following consolidation of the industry over the past three years, carriers have begun behav - ing differently. Simply put, they are, as a group, less predictable. 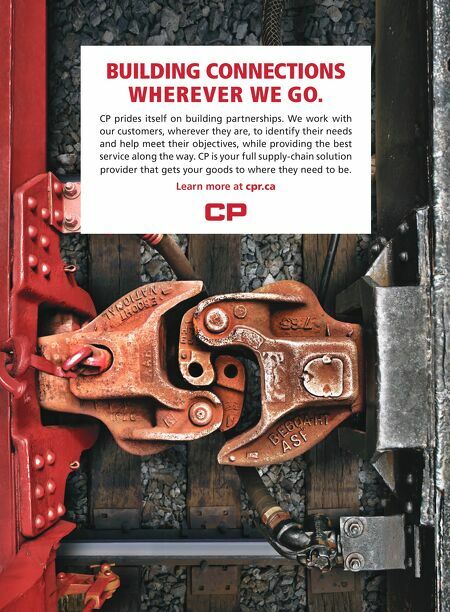 And that implies greater risk for shippers. Caution in ship ordering and deployment of tonnage was more evident in 2018 than in prior years — as seen in the trans-Pacific when carriers withdrew tonnage midyear and didn't restore it despite the front-loading of imports to avoid tariffs on China that were to have taken effect on Jan. 1, before a truce was called in early December. The combination of capacity restraint and an unnatural spike in volumes drove trans-Pacific spot rates to a five-year high and created tight capacity in the eastbound trade, where shippers faced diffi- culties getting containers loaded — another reminder that low contract rates secured in a weaker market earlier in the year can come back to haunt shippers if the market tightens during the peak season. Maersk and other carriers have said they will exercise caution in capacity in 2019. As Drewry noted last fall, "there are signs that some aspects of predatory pricing practices are receding and carrier vessel deployment more disciplined." Some carriers also have begun to behave differ- ently in regard to what business they see them- selves being in, adding another wild card. While carriers such as Hapag-Lloyd and ONE see them- selves as traditional ocean carriers and are aiming to maximize efficiency and improve the customer experience, Maersk and CMA CGM are reinventing themselves as end-to-end logistics providers, a new direction for traditional carrier organizations. In an unpredictable market that includes one- of-a-kind factors such as the Jan. 1, 2020, IMO sul- fur cap, that could prove an ill-timed distraction, given that the majority of revenue is still derived from ocean freight, as Credit Suisse transport analyst Neil Glynn told the JOC Container Trade Europe Conference in Hamburg in September. The second change is on the demand side, which is weakening as 2019 begins. Trans-Pacific demand in early 2019 will be denied the volumes that were pushed to arrive before imposition of the threatened China tariffs. On top of that, the US economy is slowing. While US growth in 2018 was well-above-trend at 2.9 percent, compared with 2.2 percent in 2017, it will slow this year, according to IHS Markit Chief Economist Nariman Behrevesh. "The acceleration was almost entirely due to a large dose of fiscal stimulus (tax cuts and spending increases put in place at the beginning of the year. The impact of this stimulus will still be felt in 2019, but with diminishing potency as the year progresses," he wrote in December. As a result, IHS Markit expects growth of 2.6 percent in 2019, down from the torrid 2018 pace but not a dramatic reversal. The third change is the ever-closer implemen - tation of the IMO sulfur cap. As we have been arguing this fall, it's hard to envision carriers going into the 2018-2019 contract negotiations in a strong position, given likely weakness in early year volumes, which increases the likelihood that in competition for volumes and market share, at least some carriers will compromise on compensa- tion for expected higher low-sulfur fuel costs. If carriers buckle — and whether they do is the biggest question hanging over early 2019 — watch out, because if low-sulfur fuel ends up being more expensive than traditional bunkers, as many expect, carriers will need more revenue to avoid losses. If they don't get it in the form of fuel surcharges, that sets up the potential for carriers to resort to capacity withdrawals as the only tool to get rates high enough to cover the higher costs. Remember 2010? In the immortal words of Yogi Berra, it could be "déjà vu all over again." JOC email: peter.tirschwell@ihsmarkit.com twitter: @petertirschwell If there was ever a year when the outlook for reliability in the system was more clouded, 2019 and into 2020 would take the prize.